American University (AU or American) is a private, coeducational, liberal arts curriculum, doctoral, and research-based university in Washington, D.C., United States, affiliated with the United Methodist Church, although the university's curriculum is secular. The university was chartered by an Act of Congress on February 24, 1893 as "The American University," when the bill was approved by President Benjamin Harrison. Roughly 7,200 undergraduate students and 5,230 graduate students are currently enrolled. AU is a member of the Consortium of Universities of the Washington Metropolitan Area. A member of the Division I Patriot League, its sports teams compete as the American University Eagles. AU's 84-acre campus is designated as a national arboretum and public garden that has a rich botanical history. American's main campus is located at the intersection of Nebraska and Massachusetts Avenues at Ward Circle in the Spring Valley neighborhood of Northwest Washington. The area is served by the Tenleytown-AU station on the Washington Metro subway line in the nearby neighborhood of Tenleytown. AU was named the "most politically active school" in the nation in The Princeton Review's annual survey of college students in 2008, 2010, and 2012. American University is especially known for promoting international understanding reflected in the diverse student body from more than 150 countries, the university’s course offerings, the faculty's research, and from the regular presence of world leaders on its campus. The university has six unique schools, including the well-regarded School of International Service (SIS) that is currently ranked 8th in the world for its graduate programs in International Affairs by Foreign Policy. and the Washington College of Law. The American University was established in the District of Columbia by an Act of Congress on December 5, 1892, primarily due to the efforts of Methodist Bishop John Fletcher Hurst. After more than three decades devoted principally to securing financial support, the university was officially dedicated on May 15, 1914. The first instruction began on October 6 of that year, when 28 students were enrolled (19 of them graduate students, nine of them special students who were not candidates for a degree). The First Commencement, at which no degrees were awarded, was held on June 2, 1915. The Second Annual Commencement was held on June 2, 1916 where the first degrees (one master's degree and two doctor's degrees) were awarded. Shortly after these early commencement ceremonies, classes were interrupted by war. During World War I, the university allowed the U.S. military to use some of its grounds for testing. In 1917, the U.S. military divided American University into two segments, Camp American University and Camp Leach. 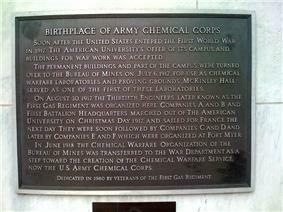 Camp American University became the birthplace of the United States' chemical weapons program, and chemical weapons were tested on the grounds; this required a major cleanup effort in the 1990s. Camp Leach was home to advanced research, development and testing of modern camouflage techniques. As of 2014, the Army Corps of Engineers is still removing ordnance including mustard gas and mortar shells. During the next ten years, instruction was offered at the graduate level only, in accordance with the original plan of the founders. 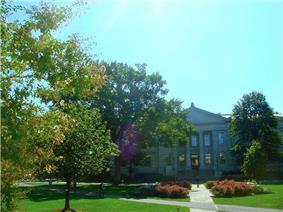 In the fall of 1925, the College of Liberal Arts (subsequently named the College of Arts and Sciences) was established. Since that date, the University has offered both undergraduate and graduate degrees and programs. In 1934, the School of Public Affairs was founded. During World War II, the campus again offered its services to the U.S. government and became home to the U.S. Navy Bomb Disposal School and a WAVE barracks. For AU's role in these wartime efforts, the Victory ship SS American Victory was named in honor of the university. The present structure of the university began to emerge in 1949. The Kogod School of Business); the School of Government and Public Administration in 1957; and the School of International Service in 1958. In the early 1960s, the Department of Defense and the Central Intelligence Agency operated a think tank under the guise of Operation Camelot at American University. The government abandoned the think tank after the operation came to public attention. 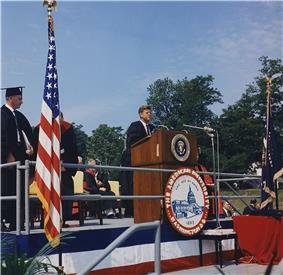 AU's political intertwinement was furthered by President John F. Kennedy's Spring 1963 commencement address. In the speech, Kennedy called on the Soviet Union to work with the United States to achieve a nuclear test ban treaty and to reduce the considerable international tensions and the specter of nuclear war during that juncture of the Cold War. From 1965 to 1977, the College of Continuing Education existed as a degree-granting college with responsibility for on- and off-campus adult education programs. The Lucy Webb Hayes School of Nursing provided undergraduate study in Nursing from 1965 until 1988. In 1972, the School of Government and Public Administration, the School of International Service, the Center for Technology and Administration, and the Center for the Administration of Justice (subsequently named the School of Justice) were incorporated into the College of Public and International Affairs. The University bought the Immaculata Campus in 1986 to alleviate space problems. This would later become Tenley Campus. In 1986, construction on the Adnan Khashoggi Sports and Convocation Center began. Financed with $5 million from and named for Saudi Arabian Trustee Adnan Khashoggi, the building was intended to update athletics facilities and provide a new arena, as well as a parking garage and office space for administrative services. Costing an estimated $19 million, the building represented the largest construction project to date, but met protest by both faculty and students to the University's use of Khashoggi's name on the building due to his involvement in international arms trade. In 1988, the College of Public and International Affairs was reorganized to create two free-standing schools: the School of International Service and the School of Public Affairs, incorporating the School of Government and Public Administration and the School of Justice. That same year, construction on the Adnan Khashoggi Sports Center completed while the Iran-Contra Affair controversy was at its height although his name remained on the building until after Khashoggi defaulted on his donation obligation in the mid to late 1990s. The School of Communication became independent from the College of Arts and Sciences in 1993. In 1997, American University of Sharjah, the only coeducational, liberal arts university in the United Arab Emirates, signed a two-year contract with AU to provide academic management, a contract which has since been extended multiple times through August 2009. A team of senior AU administrators relocated to Sharjah to assist in the establishment of the university and guide it through the Middle States Association of Colleges and Schools accreditation process. In 2003, American launched the largest fund raising campaign in its history. The program, ANewAU, has a goal of raising $200 million. As of October 2009, the University had raised $189.6 million. When the campaign is completed, the University's website stated that it would "help to attract and retain the finest faculty, increase scholarship support, create and endow research and policy centers, ensure state-of-the-art resources in all of our schools and colleges, expand global programs, and secure the long-term financial health of the university by boosting the endowment." 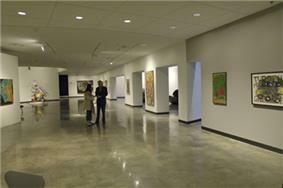 In the fall of 2005, the new Katzen Arts Center opened. Benjamin Ladner was suspended from his position as president of the university on August 24, 2005, pending an investigation into possible misuse of university funds for his personal expenses. University faculty passed votes of no confidence in President Ladner on September 26. On October 10, 2005, the Board of Trustees of American University decided that Ladner would not return to American University as its president. Dr. Cornelius M. Kerwin, a long-time AU administrator, served as interim president and was appointed to the position permanently on September 1, 2007, after two outsiders declined an offer from the Board of Trustees. According to The Chronicle of Higher Education, Ladner received a total compensation of $4,270,665 in his final year of service, the second highest of any university president in the United States. Ground was broken for the new School of International Service building on November 14, 2007 and completed in 2010. A speech was given by Senator Daniel K. Inouye (D-HI). American University has two non-contiguous campuses used for academics and student housing: the main campus on Massachusetts Avenue, and the Tenley Campus on Nebraska Avenue. An additional facility houses the Washington College of Law, located half a mile northwest of the main campus on Massachusetts Avenue. 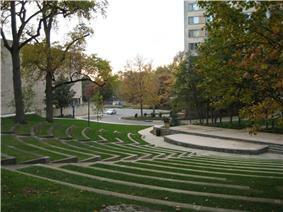 Additionally, AU owns several other buildings in the Tenleytown and Spring Valley, and American University Park areas. The first design for campus was done by Frederick Law Olmsted but was significantly modified over time due to financial constraints. The campus occupies 84 acres (340,000 m²) adjacent to Ward Circle, the intersection of Nebraska and Massachusetts Avenues. 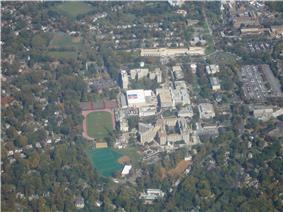 AU's campus is predominantly surrounded by the affluent residential neighborhoods characteristic of the Northwest Quadrant of Washington, D.C. Highlights of the campus include a main quadrangle surrounded by academic buildings, nine residential halls, a 5,000-seat arena, and an outdoor amphitheatre. The campus has been designated a public garden and arboretum by the American Public Garden Association, with many foreign and exotic plants and trees dotting the landscape. Hurst Hall, first building of the university, ground broken in 1896 for what was to be the College of History. The architects were Van Brunt & Howe. Now home to departments of Biology and Environmental Science, the School of Public Affairs, the University Honors Program, and the Center for Teaching Excellence. Mary Graydon Center, home to student organization offices, the main dining facilities, and the School of Communication. Katzen Arts Center, Provided for by a monetary gift from Cyrus and Myrtle Katzen, opened in 2005 and is now home to the Departments of Performing Arts (such as dance), Studio Arts, Graphic Design, and Art History, the American University Museum, and other Academic Departments. Abbey Joel Butler Pavilion, holds the campus store, the Office of Campus Life, the Career Center, and meeting spaces. School of International Service, ground broken by President Dwight Eisenhower. The new building opened for the 2010–2011 school year, with classes continuing to be held also in the original building, which has since been renamed the "East Quad Building," next door. McKinley Hall, cornerstone laid by President Theodore Roosevelt. Was previously the home of the departments of Computer Science, Audio Technology, and Physics. Has recently become the new home to the School of Communication. Battelle-Tompkins Building, the university library until 1977 and now home to the College of Arts and Sciences. Ward Circle Building, the largest classroom building on campus, built in 1968 as a home for the School of Government and Public Administration (now the School of Public Affairs). Kay Spiritual Life Center, built in 1963, a multi-denominational place of worship, home to the University Chaplains and is used for speeches and performances. Kogod School of Business, formerly known as the Myers-Hutchins Building, and previous home to the Washington College of Law. Construction finished in January 2009 to annex it to the now empty Experimental Theater and Butler Instructional Center. Contains conference rooms where students can't do work. Housing is guaranteed for two years. Most freshman and sophomore students choose to live on campus. Freshmen are not required to live on campus. The University plans to add over 1,000 new beds by 2013. Residence halls on the main campus are grouped into two "campuses". Nebraska Hall, located across Massachusetts Avenue from main campus. It features apartment-style residences and opened in August 2007. Cassell Hall, opened for the Fall 2013 semester. This residence hall is equipped with a state of the art 8,000 square foot fitness facility. Letts Hall, named after John C. Letts, university Trustee and President of the Board 1921–1931. Formerly the Immaculata School, Tenley Campus is located half a mile east of the main campus, and was purchased by American University in 1987 specifically for the Washington Semester program. Tenley Campus is currently under construction to become the new law school. Tenley Campus used to be home to the Washington Semester and Washington Mentorship Program students, though students enrolled at AU can also elect to live there. 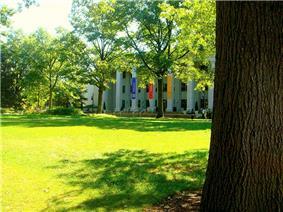 During the summer, the residence halls are used to house students in the Washington Semester - Summer Internship Program. Administratively, Tenley Campus is home to the main offices of: the School of Professional & Extended Studies, including the Washington Semester Program; University Marketing and Publications; and the Osher Lifelong Learning Institute. Capital Hall: housing 170 students, Capital Hall is the oldest and most ornate of the Tenley Campus buildings. It also contains a fitness center and the stained glass chapel that is used for dance and music recitals. Congressional Hall: houses 156 students and contains the central reception desk for the Tenley Campus. Dunblane House: a small administrative and classroom building. Constitution Building: an administrative building. A sports field used for intramural sport matches. Renovating the Watkins Art Building to add classrooms and administrative space (Complete). Renovating the old Kreeger Music Building to house the Department of Economics (complete). Roper Hall converted to student housing (complete). Clark Hall converted to student housing (complete). The old SIS building now known as the East Quad Building will be renovated to house administrative and classroom space for parts of the School of Education, Teaching, and Health, and the Department of Mathematics and Statistics, giving these departments a presence on the Friedheim Quadrangle (completed). 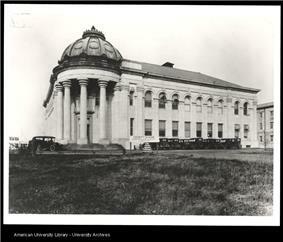 This is the original photo of the Mckinley building when it was first built. Renovation of the School of Communication McKinley Hall is now opened for use on January 6, 2014. The building is still under renovations. American University is rated "Most Selective", by the Princeton Review, with an admissions selectivity rating of 94 (on a scale of 60–99). American University enrolls about 1,500 freshmen each year, with a middle 50% GPA of 3.6–4.1 and middle 50% SAT score of 1220–1390 (critical reading and mathematics only). The average class size is 23 and the student-faculty ratio is 14:1. AU is ranked 71st among "national universities" by the US News & World Report a college and university rankings guide, and is one of the 283 universities that house a chapter of Phi Beta Kappa, the nation's oldest honor society. In 2008, 2010 and 2012, American University was named the most politically active school in the nation in The Princeton Review's annual survey of college students. In 2006, the Fiske Guide to Colleges ranked AU as a "Best Buy" college for the quality of academic offerings in relation to the cost of attendance. However, in 2013, the Daily Beast listed the school in their list of "20 Least Affordable Colleges." For two years in a row, American University has had more students chosen to receive Presidential Management Fellowships than any other college or university in the country. In spring 2006, 34 graduate and law students were chosen for the honor. The Kogod School of Business, the first school of business in Washington, was named by The Wall Street Journal and Business Week magazine as one of the top business schools in the country. "Kogod is positioning itself squarely in the upper echelons of America's finest business schools," according to the Princeton Review. The Wall Street Journal ranked the Kogod School of Business in its 2004 “Top 50 MBA Programs.” "On September 16, 2007 the Wall Street Journal announced their 2007 graduate rankings, and the Kogod School of Business was ranked 36 out of the top 51." The School of International Service (SIS) is recognized as the largest of its kind in the U.S. Among The Association of Professional Schools of International Affairs (APSIA) schools, AU's School of International Service has the largest number of minority students and female students and is ranked 6th among APSIA schools in numbers of international students. A review in Foreign Policy Magazine ranked the school 8th in the country for preparing future foreign policy professionals and 25th for academic careers. SIS's undergraduate programs earned a spot at number 11, and its graduate programs were ranked number 8. Because the field of international relations is not evaluated by U.S. News & World Report, the College of William and Mary recently published the results of their survey, which ranked the AU international relations master's degree in the top 10 in the United States and the doctoral degree in the top 25. The School of Communication is among the top 25 in the nation, and it graduates the third largest number of communication professionals among U.S. colleges and universities. The School of Public Affairs is ranked among the top 15 programs in the country by U.S. News and World Report. Washington College of Law's clinical program ranks second in the nation, its international law program is ranked 6th in the nation and the school overall ranks among the top 50 U.S. law schools according to U.S. News and World Report's America's Best Colleges. American University is especially known for promoting international understanding. This is reflected in the diverse student body who is from more than 150 countries, the university’s course offerings, the faculty's research, and from the regular presence of world leaders on its campus. American University has the 12th largest number of graduates in current Peace Corps service (34), and ranks fourth in the number of Peace Corps volunteers as a percentage of the total undergraduate population. American University has earned a reputation among the best schools in the nation for international relations, government and political science, as well as a hub for arts in Washington, D.C. The school has a long history of partnership with the Washington metropolitan area, beginning with its charter by the U.S. Congress in 1893. The University takes its responsibility to the community very seriously. In 2001, AU's economic impact on the District of Columbia totaled more than $600 million. WAMU, American's National Public Radio Station, is one of the top 5 NPR stations in the country. "Over 80% of AU undergraduate students and 60% of graduate students complete an internship or other experiential education experience by graduation. Fifty-seven percent of AU’s undergraduate and 40% of graduate students participate in significant community service in the local community by graduation," according to their website. Internationally, AU ranked 431-440 overall by QS World University Rankings in 2014.
Notable alumni of American University include broadcaster David Aldridge, Blackboard Inc. co-founders Matthew Pittinsky and Michael Chasen, Director of intelligence and security in Iraqi Kurdistan Masrour Barzani, author Max Brooks, former US Senator Robert Byrd, Fox News TV anchor and journalist Neil Cavuto, President and COO of Goldman Sachs Gary Cohn, actress America Ferrera, NBC anchor of Meet the Press David Gregory, American actress Goldie Hawn, CEO of the Democratic National Committee Amy Dacey, TV personality Star Jones,Suffragist Leader Alice Paul, Bahraini Crown Prince Salman bin Hamad bin Isa Al Khalifa, aviation expert Stephen Latchford, American screenwriter Barry Levinson, Prime Minister of Grenada Keith Mitchell, human rights activist John Prendergast, cryptographer Bruce Schneier, C-SPAN journalist Steve Scully, TV personality Judith Sheindlin ("Judge Judy"), and former NBA player Kermit Washington. Since 1990, the Cyrus Ansary Medal has been awarded annually, one of the highest volunteer awards given by the university. Recipients include alums, "trustees, volunteers, and community leaders who set high standards for achievement and serve as role models to American University's students and alumni". Recent recipients include J. Willard Marriott Jr., Alan L. Meltzer, Kermit A. Washington and Hani M. S. Farsi. The university also recognizes "outstanding commitment ... through leadership and philanthropic support" with the President's Award, given annually since 1982, and givers in a series of levels in the President's Circle which "honor five U.S. presidents who were friends of American University". The university is composed of seven divisions, referred to as colleges or schools, which house its academic programs: College of Arts and Sciences (CAS), Kogod School of Business (KSB), School of Communication (SOC), School of International Service (SIS), School of Public Affairs (SPA), School of Professional & Extended Studies (SPExS) and Washington College of Law (WCL). With the exception of WCL, undergraduate and graduate courses are housed within the same division, although organized into different programs. Students who do not declare into a specific school are sorted into CAS, which combine with its variety of academic programs to make it the largest division, followed by SIS, SPA, WCL, KSB and SOC. American University is also home to a unique program known as the Washington Semester Program. This program partners with institutions around the world to bring students to AU for a semester. The program operates as part of the School of Professional & Extended Studies. The program combines two seminar courses on three days a week with a two day per week internship that gives students a unique look at Washington, D.C. The program is unique in that the courses are not typical lecture courses; instead, speakers from various sectors of a particular field are invited to address the class, often from different perspectives. In the Chronicle of Higher Education survey of college presidents' salaries for 2007–08, President Cornelius M. Kerwin was fifth highest in the nation with a compensation of $1.4 million. The Jack I. and Dorothy G. Bender Library and Learning Resources Center is the main library facility for the campus. A branch Music Library is located in the Katzen Art Center. 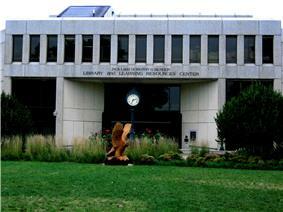 The Pence Law Library, part of AU's Washington College of Law, operates separately from the main library system. The University Library is part of the Washington Research Library Consortium (WRLC), which includes seven other libraries. The WRLC operates a consortium loan service between member institutions and has a shared collections site in Upper Marlboro, Maryland. The Bender Library provides a variety of individual and group study spaces and includes a Curriculum Materials Center, a New Media Center, Graduate Research Center, classrooms, and a café. About 160 public computer workstations are available throughout the Bender building and researchers also may borrow laptops, chargers, tablets, and other electronic devices. In October 2012, the library acquired a large poster printer which researchers may use for presentations and other academic purposes. The Library's Archives and Special Collections houses unique and rare materials and information on the history of the institution. The University Archives is the repository for papers and other documents, including sound recordings and photographs, spanning more than a century of the University's history. Special Collections houses rare materials. Among the more important holdings are the Artemas Martin collection of mathematical texts, the Charles Nelson Spinks collection of artistic and historical works of Japan, the Irwin M. Heine collection of literary works, and Christopher Johnson collection of William Faulkner books. Playbills form a significant set of the collections with the James Carroll and Iris Lipkowitz collections most notable among them. Other significant collections include the Barlett & Steele Archive, the John R. Hickman Collection, the Friends of Colombia Archives, the Records of the National Peace Corps Association, the Records of the National Commission on the Public Service, the Sally L. Smith Papers, and the Records of Women Strike for Peace. AU has over 240 recognized organizations on campus, ranging from political and social . The Student Union Board (SUB), a part of the Student Government, is AU's oldest student-run organization. Since 1963, the SUB has arranged big name concerts and live entertainment for AU. Acts have ranged from the Grateful Dead to Ben Folds. Past acts include Bob Dylan, Andrew WK, Phantom Planet, Everclear, Ben Kweller, Jimmy Eat World, Paramore, Stephen Lynch, Jim Gaffigan, Snow Patrol, Ghostface Killah, Ted Leo and the Pharmacists, and Blackalicious. SUB also screens free second-run movies for the AU community, known as SUB Cinema. The Kennedy Political Union, a part of the Student Government, is AU's student-run and student-funded speakers bureau, charged with arranging for quality political speakers since the 1968–1969 academic year. The American University Debate Society competes as a member of the American Parliamentary Debate Association, and is currently ranked fifth in the nation. Clocks and Clouds, the undergraduate journal for public and international affairs. While American University is affiliated with the United Methodist Church, it also has many organizations that serve students of other religions. In addition to the AU United Methodist Community, American University has a variety of religious life groups including Chabad Lubavitch of the AU Community, American University Hillel, the Jewish Student Association, and many others. 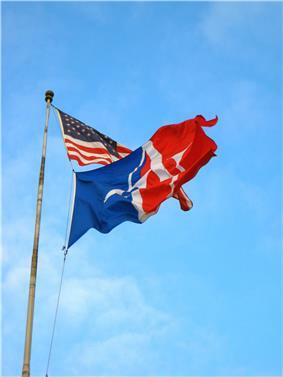 American University has a Panhellenic Association (PHA), Interfraternity Council (IFC), National Pan-Hellenic Council (NPHC), and Multicultural Greek Council (MGC). American University has an Environmental Issues Project Team to recommend steps about how to fulfill the University's responsibility to protect the environment to the administration. The Team also works to increase environmental awareness on campus. Student environmental activism has grown into a major presence on American's campus. The student environmental group, EcoSense, works with regional and national organizations such as the Chesapeake Climate Action Network, The Campus Climate Challenge, Energy Action Network, Step It Up 2007, DC Woodlands, Power Shift, and the DC Youth Environmental Alliance. An environmental science class at American conducted a study from February to April 2009 to measure the amount of food waste avoided by eliminating trays from one of the college's dining halls. The class found that trayless dinners resulted in 47.1% less solid waste than dinners during which trays were used, spurring a student-driven campaign to go trayless across campus. The University's overall grade on the College Sustainability Report Card improved dramatically between 2008 and 2009 from a "D+" to a "B-", demonstrating the University's commitment to environmental responsibility. In 2011, the Association for the Advancement of Sustainability in Higher Education (AASHE) awarded American University a gold rating, the highest possible, on their STARS scale for sustainability. In the same year American University's School of International Service building received the Leadership in Energy and Environmental Design (LEED) Gold certification for its 70,000 square foot building that is renowned for sustainable design and "cradle-to-cradle" philosophy. Reeves Field, home to AU's soccer team, is one of the premier soccer fields in Washington. Reeves Field earned the 2002 College Soccer Field of the Year by the Sports Turf Managers Association, hosted its fifth NCAA Tournament game, and served as the training site for the Uruguayan national football team. Barcelona and Blackburn Rovers used Reeves Field as a training facility. In the summer of 2000, AU served as the practice site for Newcastle United, one of England's premier professional soccer clubs. Major League Soccer's D.C. United, Miami Fusion and San Jose Earthquakes have also practiced at AU. National teams from the U.S., Bolivia, and Portugal trained at Reeves in 1996 in preparation for Summer Olympic games held at RFK Stadium. Reeves Field also features a six-lane track to accommodate the track and field programs at AU and functions as a multi-purpose event site. During his term as Vice President, U.S. Naval Observatory, located about two miles (3 km) from American University, to run the track at Reeves Field. AU's nationally ranked field hockey and women's lacrosse teams play on the field at the Jacobs Recreational Complex, which also features a softball diamond and two outdoor sand volleyball courts. AU's field hockey team earned the right to host the 2005 Patriot League Tournament, where American defeated Lehigh University 7–0 in the semifinals before capturing the league crown for the third straight year by downing Holy Cross 4–2 in the Championship Game. American University features seven outdoor tennis courts for the use of the intercollegiate tennis teams as well as the University community. Two outdoor basketball courts complete the outdoor recreational facility located next to Reeves Field and behind Bender Arena. AU has hosted three of the last four tennis team championships since joining the Patriot League, with the men's team winning back-to-back titles on the AU hardcourts and setting Patriot League Championship attendance records each year. The women's team last captured the Patriot League title in 2002. Both tennis teams have since been cut from the athletics program. In 2007, AU Junior Josh Glenn won the NCAA Division I National Wrestling Title for 197 lb (89 kg). This was the first time since 1966 that an AU athlete won a national championship. On March 14, 2008, AU earned its first NCAA Tournament berth in men's basketball by defeating Colgate University in the Patriot League Championship Game. However, AU lost its first-round NCAA tournament game against the University of Tennessee. On March 13, 2009 AU's men's basketball team repeated as Patriot League Champion by defeating Holy Cross 73–57, earning an automatic bid to the NCAA Men's Division I Basketball Championship. They ultimately lost to Villanova University in the first round on March 19, 2009 with a final score of 80–67. For the spring semester of 2009, AU men's swimming and diving team posted a 3.54 GPA, the highest team grade-point average of all Division I swimming and diving programs according to the Collegiate Swim Coaches Association of American (CSCAA). In 2011, AU's wrestling team placed 5th at the 2011 NCAA Division 1 Wrestling Championship, the highest AU Wrestling have ever placed in school history. In addition, HWT Wrestler Ryan Flores made it to the NCAA Finals, the 2nd time in school history to ever make it to the NCAA Finals. American University's wrestling program is a member of the EIWA, as the Patriot League is a non-wrestling conference. All hail the mighty AU Eagles! Where there's a fight we'll see it through! When we wear red, white and blue! So let's all join in and give a yell for AU and victory!! Calling days that flew so fast. AU offers one of the most comprehensive and renowned study abroad programs in the United States. Open to both AU Students as well as students from other American universities, students can choose to participate in a number of programs around the globe. Utilizing partner institutions as well as AU-operated programs abroad, students can take courses and intern in 145 different study abroad programs. Additionally, students can study at a non-partnered or hosted institution abroad through AU Abroad. Programs are offered by semester, year or summer. More than 850 AU students study abroad annually on programs offered by AU Abroad and other areas within the University. Over 60% of all AU students will have a study abroad before graduation. In 2010, the Institute of International Education ranked American University 5th in the nation among doctoral institutions for study abroad. American University also operates a public radio station, WAMU, broadcasting at 88.5 MHz on the FM band. The commercial-free station is affiliated with National Public Radio (NPR) and Public Radio International. The station began broadcasting as the student radio station, but developed into a professionally staffed station when the administration spun off the student radio station. Students may still hold internships. Original programming includes The Diane Rehm Show and The Kojo Nnamdi Show. The student-run radio station's callsign is WVAU, and is an internet-only station. American University was one of the first universities in the nation to adopt wireless technology across all campus buildings back in 2001. As a result, AU has been classified as one of the most "unwired" campuses in the U.S. by Intel. In 2004, AU expanded its wireless presence by teaming with T-Mobile to first convert AU into the first HotSpot campus. Then again in 2005, when the Kogod School of Business became the first business school to integrate RSS data services with BlackBerry devices distributed to all graduate business students. Shortly after implementing RSS services, the university began providing podcasts for on-demand educational multimedia, such as lectures, playable on such programs as iTunes and compatible MP3 players as Apple's iPod. The University Library also launched a program whereby its Media Services Department began converting films to digital format for exclusive use by faculty in teaching their coursework for streaming media content. In 2009, American University identified "employing technology to empower excellence" as an enabling goal of the University's Strategic Plan. There has been a concerted effort by the central Office of Information Technology (OIT) to consolidate and standardize the IT infrastructure, resulting in a more stable and manageable architecture. Legacy systems have been replaced with industry recognized enterprise-level systems. From 2010-2012, the campus upgraded or replaced the following systems: a new enterprise content management system, a collaboration portal, an enhanced administrative and student information systems, a business intelligence platform, an integrated messaging system, a robust storage area network, a new firewall, and a more customer-friendly network access control. The campus network infrastructure has been upgraded and modernized, along with a state-of-the-art campus wireless. OIT has reached and even exceeded its goal to maintain at least a 99.9% average for uptime and reliability of core services, largely through the virtualization of servers and also the establishment of a second data center to address the continuity of operations plan. In 2011, a high-performance computing cluster was created to support advanced computing applications. The university is in the process of piloting virtual computing with the goal of providing students and research faculty access to important software from anywhere, without needing to go to a physical lab. ^ "AU 990 Form FY 2013". Retrieved 2014-09-26. ^ "Discover AU: Fast Facts". American.edu. 2012-04-03. Retrieved 2013-06-19. ^ "AU Web Guidelines – Hex/RGB Color Values". American University. Archived from the original on 2 September 2010. Retrieved August 26, 2010. ^ a b "Discover AU: Fast Facts". American University. Archived from the original on 25 October 2010. Retrieved October 25, 2010. ^ :: AU : Board of Trustees. .american.edu. Retrieved on 2011-11-22. ^ a b "AU Students Named Most Politically Active""Princeton Review." Retrieved October 4, 2008. ^ a b c d e f g "About the University". Retrieved March 16, 2007. ^ Avey et al (Jan–Feb 2012). "Ivory Tower". Foreign Policy. Retrieved 6 February 2012. ^ "TRIP Around the World: Teaching, Research, and Policy Views of International Relations Faculty in 20 Countries". Institute for the Theory and Practice of International Relations. College of William & Mary. Retrieved 6 February 2012. ^ "The School of Public Affairs at American University". Spa.american.edu. Retrieved 2012-07-23. ^ "1963 Commencement" June 10, 1963. Retrieved February 5, 2007. ^ "A New AU". Retrieved February 5, 2007. ^ "Why a new AU", inactive webpage at american.anewau.gov-library.us. Retrieved February 18, 2008. ^ American University (2007). "President-Elect Cornelius M. Kerwin biography". Retrieved 2007-07-20. ^ American University. Retrieved December 22, 2008. ^ Ober, Lauren (2013-01-14). "AU Names Cassell Hall". American University Washington DC. Retrieved 2013-03-13. ^ "Presentation to Faculty Senate", inactive webpage at american.edu/finance, March 1, 2006. Retrieved February 5, 2007. ^ "Facilities Projects" Office of the University Architect, American University. Retrieved February 5, 2007. 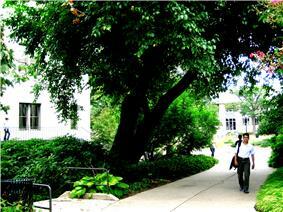 ^ "MGC to be renovated over summer"The Eagle Online. October 26, 2006. Retrieved February 5, 2007. ^ a b c d e f American University:: Vpfin:: Fas:: Fpd:: Facilities Projects. American.edu (2009-06-03). Retrieved on 2011-11-22. ^ Construction on campus progresses – The Eagle Online. Media.www.theeagleonline.com (2007-09-05). Retrieved on 2011-11-22. ^ AU President Thanks Community for Snow Efforts | American University, Washington, D.C. American.edu (2010-02-11). Retrieved on 2011-11-22. ^ a b c d Inactive webpage at finance.american.edu (2009-06-03). Retrieved on 2011-11-22. ^ A new home for SIS – The Eagle Online. Media.www.theeagleonline.com (2007-11-14). Retrieved on 2011-11-22. ^ Frank, Adrienne. (2010-05-14) SIS Celebrates Opening of New Green Gern – American University. American.edu. Retrieved on 2011-11-22. ^ "Academic Ranking of World Universities 2014-United States". ShanghaiRanking Consultancy. Retrieved August 15, 2014. ^ "America's Top Colleges". Forbes. Retrieved 27 October 2014. 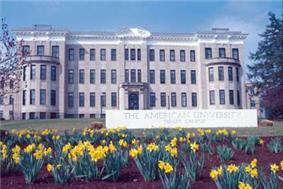 ^ "American University". U.S. News and World Report. Retrieved 23 September 2013. ^ "About the Rankings". Washington Monthly. Retrieved October 19, 2013. ^ "2014 National Universities Rankings". Washington Monthly. Retrieved 27 October 2014. ^ "University Rankings". Quacquarelli Symonds Limited. Retrieved September 18, 2014. ^ a b "American University Rankings". QS Top Universities. Retrieved 27 October 2014. ^ "World University Rankings". THE Education Ltd. Retrieved October 2, 2014. ^ "American University", inactive webpage at princetonreview.com. Retrieved April 27, 2011. ^ a b "About the University". Retrieved February 5, 2007. ^ "American University", inactive webpage at education.yahoo.com. Retrieved February 5, 2007. 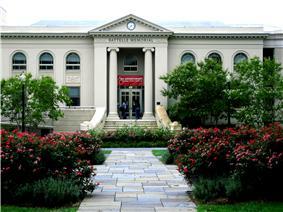 ^ "Getting Started | Undergraduate Admissions". Retrieved December 30, 2010. ^ "National Universities: Top Schools", US News and World Report. Retrieved September 12, 2013. ^ "20 LEAST AFFORDABLE COLLEGES". The Daily Beast. October 16, 2013. Retrieved 23 October 2013. ^ a b c d e AU Presidential Search Description, inactive pdf at american.edu/presidential_search. Retrieved April 2, 2007. ^ "American University", inactive webpage at princetonreview.com. Retrieved February 5, 2007. ^ Rankings at a Glance, inactive webpage at collegejournal.com. Retrieved on 2011-11-22. ^ "Foreign Policy survey ranks SIS master’s program in top-10" at the Wayback Machine (archived January 10, 2009). American Weekly. March 8, 2007. Retrieved April 2, 2007. ^ "U.S. News and World Report Best Public Affairs Graduate Schools". U.S. News and World Report Rankings. Retrieved 7 February 2014. ^ "Campus Update" Memorandum from President Kerwin, February 6, 2006. Retrieved February 5, 2007. ^ "Women & Politics Institute". American University. Retrieved November 4, 2009. ^ "Cryus Ansary Award", american.edu. Retrieved 2014-04-04. ^ "Hani M. S. Farsi: American University Cyrus A. Ansary Medal 2012", vimeo.com from American University, November 2, 2012. Retrieved 2014-04-04. ^ "President's Award", american.edu. Retrieved 2014-04-07. ^ "President's Circle", american.edu. Retrieved 2014-04-07. ^ "Washington Semester at American University". Retrieved February 5, 2007. ^ De Vise, Daniel (November 2, 2009). "Ex-president of GWU lead in pay survey". Washington Post. p. B1. ^ american.edu Retrieved June 15, 2011. ^ "Student Media". American University. Retrieved 2011-10-06. ^ "American University United Methodist Community". Aumethodists.org. Retrieved 1 January 2013. ^ "AU United Methodist Community: About Us". AU United Methodist Chaplaincy. Retrieved June 13, 2013. ^ Hecht, Yehoshua; Hecht, Esti. "Chabad Lubavitch of the AU Community: About Us". ChabadAU.org. Retrieved June 13, 2013. ^ "American University Hillel: About US". AUHillel.org. Retrieved June 13, 2013. ^ "About JSA". American University Jewish Student Association. Retrieved June 13, 2013. ^ "Environmental Issues Project Team". American University. Archived from the original on 23 June 2009. Retrieved 2009-06-08. ^ "Profile: American University's EcoSense". DC Youth Environmental Alliance. Retrieved 2009-06-08. ^ "News Release: American University Environmental Science Department Finds Cafeteria Waste Reduction in Trayless Study". 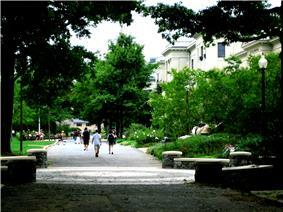 American University Department of Environmental Science. Retrieved 2009-06-08. ^ American University – Green Report Card 2009. Greenreportcard.org (2007-06-30). Retrieved on 2011-11-22. In 2011, American University's School of International Service building received the Leadership in Energy and Environmental Design (LEED) Gold certification for its 70,000 square foot building that is renowned for sustainable design and "cradle-to-cradle" philosophy. ^ American University | Scorecard | Institutions | AASHE STARS. Stars.aashe.org (2011-01-31). Retrieved on 2011-11-22. ^ American University Athletics. Aueagles.com (2009-07-08). Retrieved on 2011-11-22. ^ a b Welcome to American University, Washington, DC USA. .american.edu. Retrieved on 2011-12-08. ^ a b Adrienne Frank AU Ranks No. 5 in Nation for Study Abroad. American University. November 16, 2010. Retrieved January 21, 2011. ^ "American Facts" Media Relations. Retrieved February 5, 2007. ^ "NOMINATION CALL FOR THE 2007 ROGER W JONES EXECUTIVE LEADERSHIP AWARD". U.S. Marine Corps. Retrieved Oct 27, 2013. ^ "Perspectives on Executive Leadership". Government Executive Magazine. Retrieved Oct 27, 2013. ^ "Performance Awards by Type". National Institutes of Health. Retrieved Oct 27, 2013. 1893 establishments in Washington, D.C.